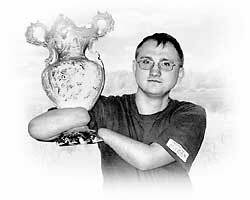 32-year-old Sergey Burlakov from Taganrog, Russia, is the first man with no arms and no legs who navigated the aircraft. He managed to flight the motor hang- glider on Tuesday. ITAR-TASS reports this was another achievement of disabled man. However, the word disabled seems inappropriate referred to this man. After losing legs and hands in the car accident Sergey managed to get back to the life at the fullest. He is famous as a winner of national and international competitions on running and swimming. Seems like there is no element that he has not conquered. Last year American journalists called Sergey Burlakov the man of the planet after he had covered 42 kilometers of the New York City Marathon. There were 34 participants from 128 countries and Burlakov was the only one with fourfold amputation, that is with artificial legs and arms. He covered the distance in six hours and fifty-one minute. The results were registered in Guinness Book. He was met at the finishing post with applause. American military personnel saluted him. Nobody can say what it cost him. When about in the middle of the distance he had to change bandages soaked in blood, a woman that was watching the event fainted. He was the first to be called out at the rewarding ceremony. Sergey was invited to participate in the next NYC Marathon. Americans are ready to make him a discount on special prosthetic devices for running. They say they will cost him $10 thousand instead of usual $30 thousand. However, for a disability pension of 1700 rubles (about $60) even with a discount this price is way too much. Burlakov is dreaming to subdue Sahara and North Pole and to go on world tour with Russian adventurer Fedor Konyukhov. These are not dreams. Sergey is making plans rather than dreaming and he is sure that he will be able to realize them soon.